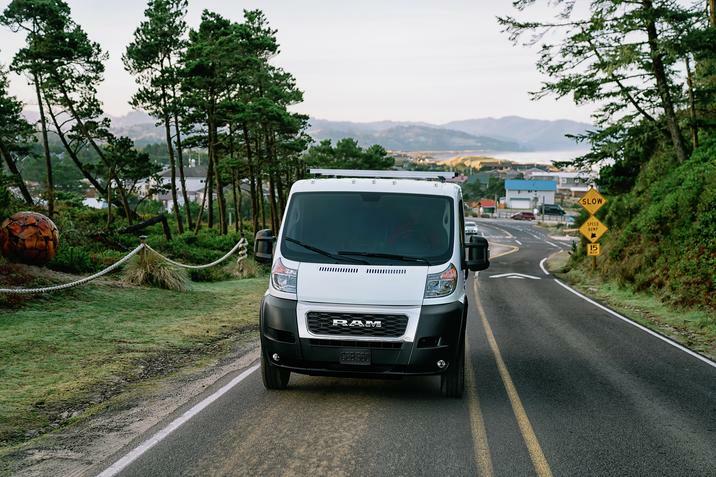 Designed for business and commercial customers, the 2019 RAM Promaster offers thoughtful design touches and work-friendly features. From its low load height to its standard convenience technologies, the 2019 RAM Promaster in Albuquerque means business. The 2019 Promaster includes cutaway, chassis cab, and full size van body styles; all come with standard two-person seating and available three-seat layouts. All 2019 body styles can be had in the 1500, the 2500, and the 3500 weight classes, for increasing levels of functionality. The Promaster is available in just one trim, with front-wheel drive and a six-speed auto transmission. As with last year's models, the RAM Promaster features a touchscreen infotainment system including Bluetooth connectivity, as well as a rearview camera. See it in action at Melloy RAM and Santa Fe Lithia Chrysler Jeep / Dodge 3. Los Lunas; we're now serving Albuquerque Santa Fe Los Lunas New Mexico. On the inside, the 2019 Promaster's dashboard is surprisingly detailed. It's chock-full of storage spaces, including multiple cupholders, and controls are easy to reach. For instance, the gearshift is close to the climate controls. While two single bucket seats are the standard configuration, there's an optional two-person passenger's seat. 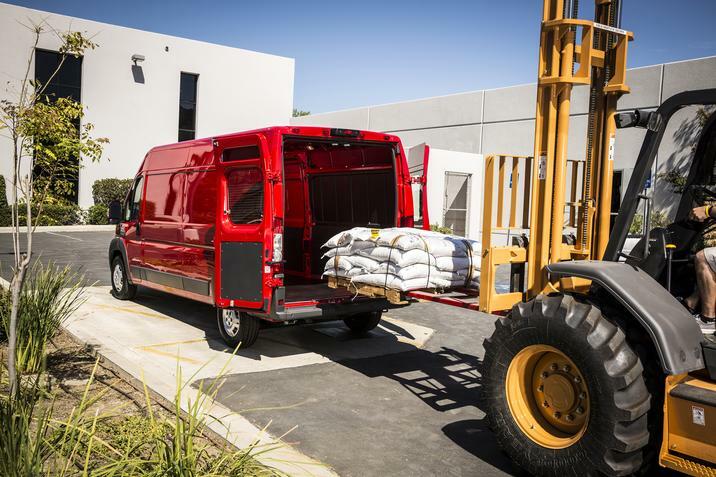 The Promaster 1500 short-wheelbase, traditional roof van has a cargo capacity of 259 ft; the 3500 model carries a whopping 463 cu. ft. of cargo in back (with a high roof, extended body, and long wheelbase. As on the outside, the interior of the 2019 RAM Promaster in Albuquerque is rather basic. Cloth upholstery is standard; AC, manually adjustable seating, power locks and windows, and telescoping steering with wheel-mounted audio controls are all included as well. Vinyl seating is optional, as is cruise control, heated seats, a leather-covered steering wheel, six-way adjustability, and seating that swivels 180°. Drivers' seats with a full suspension are available, but lack the swivel capability, heat, or adjustability. Visit us at Melloy RAM and Santa Fe Lithia Chrysler Jeep / Dodge 3. Los Lunas to see these features up close. We're proud to be serving Albuquerque Santa Fe Los Lunas New Mexico, and we're excited to do business with you. The 2019 RAM Promaster has a functional, yet modern appearance. In front, the high-mounted headlamps are placed above an expansive front fascia; there are step areas at each corner, which allow you to reach the windshield or engine bay with ease. Apart from the traditional doors up front, the Promaster has 50/50 rear doors and a hinged, glassless door on the vehicle's right side. Left-side doors, sliding side doors, and side windows are available. If you'll need a bit more room in back, the new ProMaster has an available high-roof and extended-length cargo area. 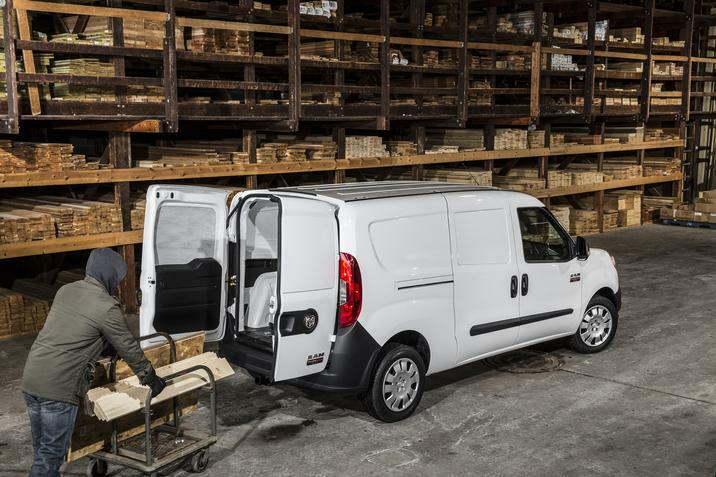 Because it's intended for work use, the 2019 Promaster has a basic range of features. These include roof clearance lights, halogen headlights, 16" steel wheels, and manual mirrors. However, you can upgrade to aluminum alloys, steel wheels with hubcaps, or painted steel wheels. Options include daytime running lights, fog lamps, heated power mirrors, and mud flaps. Visit us today for more details. For this model year, the only engine option is a 3.6L V6 that puts out 280hp. It's matched to a six-speed automatic that routes power to the front wheels, and when properly equipped it can tow up to 6800 pounds. The diesel powertrain is gone for this year. With its tight turning radius, the 2019 Promaster is a real around-town asset. The 2019 RAM Promaster can be bought in numerous configurations from specialty operations and upfitters, and it's hard to categorize them all. In its shortest wheelbase, it can turn in 36.3 ft; the longest version takes just ten feet more. Like many other commercial vehicles, the Promaster has few options. An ambulance- or tow-prep package is one of the most notable available features, but we expect fleet telematics to be available next model year. RAM offers buyers a three-year, 36,000-mile limited warranty and a five-year, 60,000-mile powertrain coverage on all new Promasters. The 2019 Promaster will not undergo crash testing from the NHTSA or the IIHS. It's equipped with side- and front-impact airbags for passengers and drivers, traction and stability control systems, and a backup camera. Fleet buyers may opt for telematics to track vehicles and govern their speed. Finally, parking sensors are optional (but highly recommended). The 2019 RAM Promaster in Albuquerque is a solid choice for business owners and fleet managers. Though it lacks the frills found in some other new vehicles, it makes it up in terms of usability and durability. Visit us at Melloy RAM and Santa Fe Lithia Chrysler Jeep / Dodge 3. Los Lunas to take a test drive or to learn more about the Promaster. We're proud to be serving Albuquerque Santa Fe Los Lunas New Mexico, and we're ready to help you find the right Promaster for your needs.